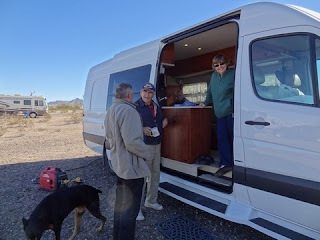 For a couple weeks each January we get together with a group of RVers. The group changes a little each year. Regardless, we usually have a good time. As long as the sun is shining and it’s warm, we congregate outside often. However, when it’s not so warm, we have to hide inside our own rigs. Campfires aren’t possible if the wind is blowing. When we first arrived in Q the wind was a little much to even consider spending time outside. Now it's calmed down and nothing but good weather with sunny skies is in the forecast. We're really hoping the weatherman doesn't blow it this time. There’s a lot to do in Quartzsite this time of year. Besides visiting with each other, the vendors provide lots of entertainment. There are several main vendor areas in town. We’ve scooted thru some of them pretty fast. After all, no one wants to be outside when it’s not warm. All of that is changing. The temperatures are predicted to be up in the 70’s for quite some time now and we’re sure glad of that. One of the latest motorhome models. Ready to place your order? We have 18 rigs in our little area at this present moment of time. For some it’s their first year and for others it’s a few more. It’s amazing how fast people can be friends out here. If people make an effort, they could find a few friends for life. I guess that’s back to the birds of a feather flocking together thing. Our first group outing was planned for Silly Al’s pizza. Reservations were made for 15 but more showed up. The bigger the group, the harder it is to find a place in this town that can accommodate all of you. The deal is there are many groups here right now and not as many places that have facilities for those groups. This time of year it's just better to plan meals out with smaller groups We're thinking that's the better answer as you're never going to get reservations for 35 people at a decent hour and receive decent service. It's just not going to happen here but it might at the Desert Bar! The winds finally died down and we even had our first campfire. We went around the circle and each one of us told our own little lies about ourselves. You know how that goes. The next night we shared our experiences at the worst RV park we had ever stayed at. Every year the Escapees put on a Happy Hour. We went for the first time with a group in 2009. Most of our group swore we’d never go back. We had higher expectations meeting a group of Escapees than what we experienced. This year we finally went back. Amazing how the attitude changes when you can go with people you know and you go not expecting anything more than a get together. The snacks kept coming and we kept talking with Tina, Jeff, Dianne and Tom. It was a good time. I tried to take some pictures of our group of 18 RVs but it’s really difficult when we’re spread all over. We like it that we’re spread but it sure makes picture taking difficult. Today I'm hoping to get out and take pictures of lots of RVs. There sure are some unusual ones around. Remember I had said there weren’t as many RVs or people this year. Well, it seems they are starting to come in now that the Big Tent is just around the corner. Parks are filling up and people seem to be everywhere. We pretty much hung around the RV Thursday morning. Terry, Mike and Lee have had a little project checking out Linda’s new RV and trying to figure out why she can't charge her batteries with a generator. We caught them in the act. Tom and Dianne (new to our group this year) even made a purchase of a new motorhome. We got to preview the prospective home before the purchase. It's sure a beauty! In the afternoon we had places to go. Our first stop was at the Tyson Wells vendors. You never really know what you’re going to find in Quartzsite. We found a few things. This is one thing we found and now Tammi wants us to buy it for her so I guess we’re going to have to go back to get it. After stopping to check out some vendors, we made our way to Plomosa Rd and the Elks auction. The auction was to support the Escapees CARE center in Texas. We went, had a great time and even made a few purchases. One of the purchases we made was a gold panning kit. We were actually in the market to buy one for a family reunion we’re planning anyway. The reunion isn’t until July but the theme is Texas Roundup. One of the activities we had already thought about was gold panning. Great blog Jeri. I am working on one and under advisement of my mentor ;) have another saved for a "rainy" day. What in the heck is the purpose of that van on top of that bus? Did they add a second story? Glad the guys were there to help Linda out. She was very appreciative on her blog. I saw that Bus with the VW on top when I was in Town the other day. Now all I gotta do is get rid of this cold/flu so I can get out there and see all the goings on. What a waste of a perfectly good VW bus! I guess it's true about one man's junk is another man's beauty. Glad the weather broke, you don't need to blow all over. Wish we were there this year, but hopefully next year. Love the Q and really missing it this years keep the postings comin, don't want to miss anything! I think I'm just going to refer everyone over to your blog. Good job.